We are in the midst of a true global cardiovascular disease (CVD) epidemic. CVD is responsible for about 30% of all deaths worldwide each year. Nearly, 80% of these deaths occur in developing countries. Indeed, CVD is the leading cause of mortality in almost every region of the world. The early (30-day) mortality rate from acute myocardial infarction (AMI) is 30%, with more than half of these deaths occurring before the stricken individual reaches the hospital. Although the mortality rate after admission for AMI has declined by ~30% over the past two decades, approximately 1 of every 25 patients who survives the initial hospitalization dies in the first year after AMI. Mortality is approximately four-fold higher in elderly patients (over age 75) compared with younger patients. The electrocardiogram (ECG) remains a crucial tool in the identification and management of AMI. Acute risk stratification in AMI is still based on simple clinical parameters; laboratory markers and 12-lead ECG. The ECG has been a preliminary screening and one of the most useful diagnostic investigations in AMI. A detailed analysis of patterns of ST-segment elevation may influence decisions regarding the perfusion therapy. The early and accurate identification of the infarct-related artery can help predict the area of myocardium at risk and guide decisions regarding the urgency of revascularization. Electrocardiographic signs of reperfusion represent an important marker of microvascular blood flow and consequent prognosis. ECG reflects the electrophysiology of myocardium during acute ischemia whereas the coronary angiography identifies the vessel anatomy. The present study has been undertaken to observe patterns of ECG changes in a patient with acute ST-elevation myocardial infarction (STEMI) and correlating these changes with coronary angiography for identifying the culprit, infarct-related artery. It was a prospective observational study carried out in 50 patients for 2 years. All patients presenting with STEMI and fulfilling the inclusion criteria were included in the study. The inclusion criteria were chest pain lasting >30 min, with ECG showing ST elevation >1 mm in at least two contiguous leads in limb leads and >2 mm in chest leads and the patient underwent coronary angiogram. ECG was taken at the time of admission whereas coronary angiography was done usually on the 3rd day after admission. Only the patients having at least 70% occlusion of a single epicardial coronary artery were included in the study. On the day of admission, patients were thrombolysed with streptokinase. Patients with a history of previous myocardial infarction (MI), prior coronary artery bypass graft surgery, congenital heart disease, ECG showing features of the left ventricular hypertrophy, left bundle branch block in baseline ECG, Prinzmetal angina, and those having two or three-vessel occlusion of more than 70% were excluded from the study. All data obtained were recorded and presented as mean ± standard deviation. The ECG findings in the patients with anterior and inferior wall MI (IWMI) were compared using the Chi-square test, as appropriate, using SPSS Version 16 software (IBM ® SPSS Statistics ® 2012) (Chicago, SPSS Inc). P < 0.05 was considered statistically significant. The sensitivity, specificity, positive predictive value, and negative predictive value of individual parameters were calculated. The study included fifty patients. Of these, 40 (80%) were males and 10 (20%) females. Out of the 50 patients, 34 (68%) had anterior wall MI (AWMI), and 16 (32%) had IWMI. 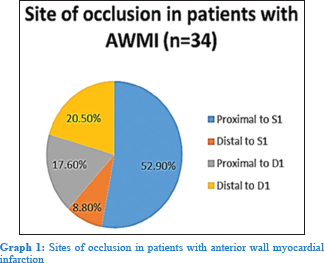 Graph 1 shows that out of 34 patients with AWMI, 52.9% patients had occlusion proximal to first septal (S1) branch of the left anterior descending artery, 17.6% had occlusion proximal to the first diagonal (D1) branch, 8.8% had occlusion distal to S1, and 20.5% had occlusion distal to D1. Twelve out of 18 patients with occlusion proximal to S1 showed ST elevation in lead V1 >2.5 mm; 2 other patients with other sites of occlusion also had the same ECG finding, yield a sensitivity of 66% and specificity of 87% (P = 0.0019). Two out of 18 patients with occlusion proximal to S1 showed complete right bundle branch block (RBBB); 1 other patient also had complete RBBB (sensitivity - 11.11%, specificity - 93.75%, P = 0.61). Seven out of 18 patients with occlusion proximal to S1 showed ST elevation in lead aVR; one other patient had this ECG finding (sensitivity - 38.89%, specificity - 93.75%, P = 0.04). Two out of 18 patients with occlusion proximal to S1 showed ST depression in lead V5; no other patient had this ECG finding (sensitivity - 11.11%, specificity - 100%, P = 0.48). Ten out of 18 patients with occlusion proximal to S1 and four patients with other sites of occlusion showed >1.0 mm ST depression in inferior leads (II, III, aVF) (sensitivity - 55.55%, specificity - 75%, P = 0.09) [Graph 2]. Three of the six patients with occlusion proximal to D1 and 11 patients with other sites of occlusion showed ST depression in inferior leads (sensitivity - 50%, specificity - 60.71%, P = 0.67). All of the three patients with occlusion distal to S1 and 2 patients with other sites of occlusion showed no ST depression (>1.0 mm) in inferior leads (sensitivity - 100%, specificity - 93.55%, P = 0.001). Six of the seven patients with occlusion distal to D1 and none of the patients with other sites of occlusion showed ST depression in aVL (sensitivity - 85.7%, specificity - 100%, P < 0.001). 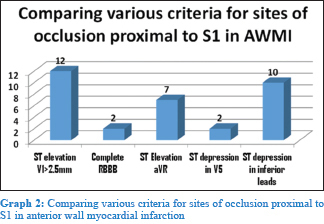 Six out of seven patients with occlusion distal to D1 and 15 patients with other sites of occlusion showed the absence of ST depression in II, III, aVF (sensitivity - 85.7%, specificity - 44.44%, P = 0.21) [Table 1]. The patients presenting with IWMI were divided into two groups based on whether the occlusion in the right coronary artery (RCA) was proximal to the RCA (PRCA group) or distal to RCA (DRCA group). Out of the 14 patients with RCA occlusion, 10 (71.42%) had PRCA occlusion and 4 (28.58%) had DRCA occlusion. All of the 14 patients with RCA occlusion while none with left circumflex (LCx) occlusion showed ST elevation in lead III >lead II (sensitivity - 100%, specificity - 100%, P = 0.008). Thirteen out of 14 patients with RCA occlusion showed ST depression >1 mm in lead I, aVL whereas none of those with LCx occlusion had these findings (sensitivity - 100%, specificity - 66%, P = 0.02). Nine of the 10 PRCA patients showed ST elevation ≥1 mm in lead V4R. Among the four DRCA patients, one showed ST elevation ≥1 mm in lead V4R. None of the patients with LCx occlusion showed this finding (sensitivity - 90%, specificity - 83%, P = 0.011). Only one of the ten PRCA patients showed ST elevation in V1. Whereas none among the four DRCA and LCx patients showed this finding (sensitivity - 10%, specificity - 100%, P = 1.00). Nine out of the 10 PRCA patients showed ST depression in V3/ST elevation lead III <0.5. Among the four DRCA patients, one patient had these ECG abnormalities but none of those with LCx occlusion (sensitivity - 90%, specificity - 83%, P = 0.0076). Two out of the four DRCA patients and one out of the 10 PRCA patients showed ST coving without ST elevation in V4R (sensitivity - 50%, specificity - 92%, P = 0.13). Three out of the four DRCA patients and one out of the ten PRCA patients had the ratio of ST depression V3/ST elevation lead III in the range of 0.5–1.2 (sensitivity - 75%, specificity - 92%, P = 0.026). Both of the LCx AMI patients showed ST elevation in lead II >III (sensitivity - 100%, specificity - 100%, P = 0.008). Both of the LCx MI patients showed isoelectric ST or ST elevation in lead I, aVL (sensitivity-100%, specificity - 93%, P = 0.025). In the present study, we compared the various ECG criteria for the diagnosis of infarct-related artery in AMI with angiographic findings as gold standard. In patients with AWMI, different criteria were analyzed to identify the culprit artery and site of the occlusion. Most of our results were consistent with a study done by Engelen et al. For localizing the culprit vessel proximal to S1, five different criteria were analyzed to identify the site of the occlusion. Our study shows that ST elevation in V1 >2.5 mm had maximum sensitivity and ST depression in V5 had maximum specificity for identifying the occlusion proximal to S1. These results were consistent with those of the study done by Engelen et al. For localizing the culprit vessel and site of occlusion proximal to D1, our study showed ST depression >1.0 mm in inferior leads was not very useful. These results were in contrast to the findings of Engelen et al. or Vasudevan et al., probably because of a smaller sample size. For localizing the culprit vessel with occlusion distal to S1, our study showed that the absence of ST depression in inferior leads had maximum sensitivity. Other ECG abnormalities showed varying accuracies. Some of these findings were consistent whereas some others were not consistent with previous studies by Engelen et al. or Vasudevan et al. For localizing culprit vessel occlusion distal to D1, ST depression in lead aVL had maximum sensitivity and specificity. Most of our findings for localization of culprit lesion distal to D1 were consistent with previous studies, except the sensitivity shown by ST depression in lead aVL. We attribute these discrepancies to the small sample size of our study [Table 2]. The diagnostic accuracy of this ECG abnormality in our study was consistent with the study by D. Luke Nair and Glancy et al. who showed a sensitivity of 96%, specificity of 40%, positive predictive value of 89%, and negative predictive value of 67% for RCA involvement. This finding is also consistent with that of a previous study by Zimetbaum et al., who had shown that a higher ST segment elevation in lead III than in lead II was only seen in RCA occlusion. Similarly, Markandeya Rao et al. also demonstrated that ST segment elevation in lead III exceeding that in lead II, had a high diagnostic accuracy for RCA occlusion (sensitivity 87%, specificity 73%, positive predictive value 93.2%, and negative predictive value 75%). Bairey et al. reported that ST segment depression in lead I and aVL was only observed during RCA occlusion. Birnbaum et al. reported that ST segment depression in lead aVL was a sensitive early ECG sign of RCA occlusion. Similarly, Huey et al. found ST depression in lead I in 22% of their LCx patients and 59% of the RCA patients, whereas Kontos et al. reported this finding in 28% of their LCx patients and 58% of their RCA patients. In the aforementioned study by Markandeya Rao et al., it was found that ST depression ≥1 mm in lead aVL was of value in predicting RCA occlusion. This criterion had a sensitivity of 82.2% which was same the previous criterion, but specificity was only 72.7%, yielding a positive predictive value of 93.5%, and a negative predictive value of 23.5% for RCA involvement. Our study findings for this ECG parameter are thus in agreement with these previous studies. This criterion had 100% sensitivity and 33% specificity for diagnosing PRCA occlusion in our study. These findings were consistent with those of Nair and Glancy In the study by Markandeya Rao et al., ST↑>1 mm in V4R was present in 15 of the 21 patients with PRCA occlusion, yielding a somewhat lower (71%) sensitivity. In addition, 6 of the 24 DRCA patients and 3 patients with LCx occlusion also had this abnormality [Table 3]. In our study, this criterion has 100% sensitivity and 13% specificity for identifying PRCA occlusion. A study by Markandeya Rao et al. showed that ST elevation in V1 was seen only in 1 patient with PRCA occlusion and none of the patients with other sites of occlusion. Nair and Glancy also reported similar findings. We found that this criterion had 100% sensitivity - 100% and 33% specificity for diagnosing DRCA occlusion. The study by Markandeya Rao et al. showed that ST depression in V3/ST elevation lead III <0.5 was present in 15 patients. Both these criteria, ST depression in V3/ST elevation lead III <0.5 and ST elevation ≥1 mm in lead V4R had highest sensitivity (71.4%) in diagnosing PRCA occlusion whereas the ST elevation in V1 had the maximum specificity. In our study, this criterion had 100% sensitivity and 15% specificity for diagnosing DRCA occlusion. However, the study by Markandeya Rao et al. showed that ST coving in V4R without ST elevation had the maximum specificity for this purpose. The admission ECG in patients with STEMI is valuable not only for determining who should and should not receive early reperfusion treatment but also for providing information regarding the location and extent of the acute myocardial injury. By reflecting the pathophysiology of the myocardium during acute ischemia important information to guide management and determine prognosis can be derived from the ECG. World Health Organization. The World Health Report 2012: Reducing Risks, Promoting Healthy Life. Geneva: WHO; 2012. Birnbaum Y, Drew BJ. The electrocardiogram in ST elevation acute myocardial infarction: Correlation with coronary anatomy and prognosis. Postgrad Med J 2003;79:490-504. Bonow RO, Mann D, Zipes D, Libby P. A Textbook of Cardiovascular Medicine. 6th ed., Ch. 12. Philadelphia, USA: Elsevier Saunders; 2001. p. 398. Janik M, Chappell CH, Green TF, Kacharava AG. Two coincident coronary anomalies: Absent left main coronary artery and origin of the right coronary artery from the middle left anterior descending artery. Tex Heart Inst J 2009;36:180-1. Vasudevan K, Manjunath CN, Srinivas KH, Prabhavathi, Davidson D, Kumar S, et al. Electrocardiographic localization of the occlusion site in left anterior descending coronary artery in acute anterior myocardial infarction. Indian Heart J 2004;56:315-9. Markandeya Rao GK, Ravindra Kumar S, Nallamaddi N. The role of ECG in localizing the culprit vessel occlusion in acute ST segment elevation myocardical infarction with angiographic correlation. J Evid Based Med Healthc 2015;2:8877-85. Lew AS, Laramee P, Shah PK, Maddahi J, Peter T, Ganz W. Ratio of ST-segment depression in lead V2 to ST-segment elevation in lead aVF in evolving inferior acute myocardial infarction: An aid to the early recognition of right ventricular ischemia. Am J Cardiol 1986;57:1047-51. Engelen DJ, Gorgels AP, Cheriex EC, De Muinck ED, Ophuis AJ, Dassen WR, et al. Value of the electrocardiogram in localizing the occlusion site in the left anterior descending coronary artery in acute anterior myocardial infarction. J Am Coll Cardiol 1999;34:389-95. Nair R, Glancy DL. ECG discrimination between right and left circumflex coronary arterial occlusion in patients with acute inferior myocardial infarction: Value of old criteria and use of lead aVR. Chest 2002;122:134-9. Zimetbaum PJ, Krishnan S, Gold A, Carrozza JP 2nd, Josephson ME. Usefulness of ST-segment elevation in lead III exceeding that of lead II for identifying the location of the totally occluded coronary artery in inferior wall myocardial infarction. Am J Cardiol 1998;81:918-9. Bairey CN, Shah PK, Lew AS, Hulse S. Electrocardiographic differentiation of occlusion of the left circumflex versus the right coronary artery as a cause of inferior acute myocardial infarction. Am J Cardiol 1987;60:456-9. Birnbaum Y, Sclarovsky S, Mager A, Strasberg B, Rechavia E. ST segment depression in a VL: A sensitive marker for acute inferior myocardial infarction. Eur Heart J 1993;14:4-7. Huey BL, Beller GA, Kaiser DL, Gibson RS. A comprehensive analysis of myocardial infarction due to left circumflex artery occlusion: Comparison with infarction due to right coronary artery and left anterior descending artery occlusion. J Am Coll Cardiol 1988;12:1156-66. Kontos MC, Desai PV, Jesse RL, Ornato JP. Usefulness of the admission electrocardiogram for identifying the infarct-related artery in inferior wall acute myocardial infarction. Am J Cardiol 1997;79:182-4.